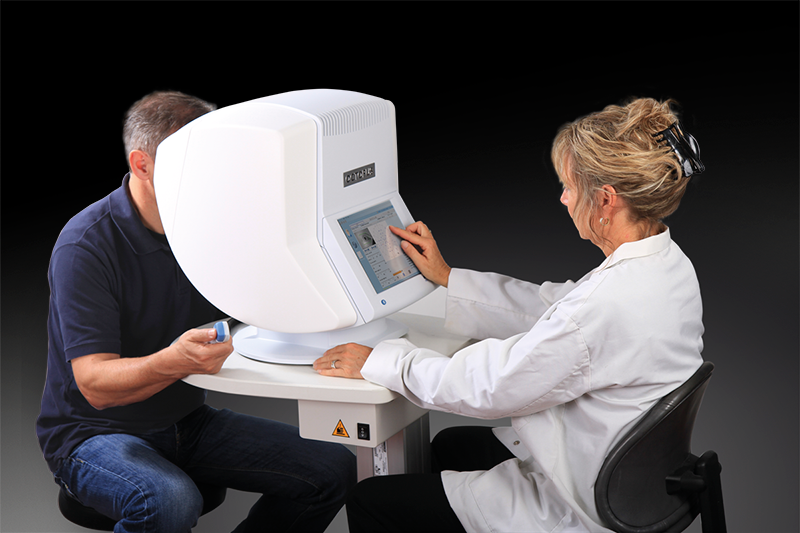 Ocular Coherance Tomography or OCT is an advanced eye scan suitable for people of all ages. Similar to ultrasound, OCT uses light waves rather than sound waves to see beneath the surface of the eye. It allows your eye doctor to see the different layers which make up the back of the eye. Using a 3D OCT camera, your eye doctor can simultaneously take a digital photograph and a 3D cross section scan of the back of the eye. This allows us to instantly diagnose a number of common conditions. The scan is non-invasive, painless and can be completed in 60 seconds or less. The health of your eyes matters to you and it matters to us too, which is why we are offering OCT to all our patients. OCT is a new, completely painless and highly advanced screening system that checks for potentially serious conditions such as glaucoma, diabetes, age-related macular degeneration, vitreous detachments and more. The visual field test can help the doctor find early signs of diseases like glaucoma that damage vision gradually. Some people with glaucoma do not notice any problems with their vision, but the visual field test shows that peripheral vision is being lost. A visual field test can also help the doctor find out more about the part of the nervous system that allows us to see. The visual part of the nervous system includes the retina (the "film" in the camera-like eye), the optic nerve (the "wire" that carries images from the retina to the brain), and the brain itself. Problems with any part of this system can change the visual field. There are well-known patterns in the test results that help doctors recognize certain types of injury or disease. By repeating more visual field tests at regular intervals, doctors can also tell whether the patient is getting better or worse. In 1972 Franz Fankhauser and others developed the principles and concepts of automated perimetry which resulted in the design of the first automated static perimeter, the Octopus 201, in 1974. Since then, Octopus has pioneered many significant innovations like the G-pattern, the direct projection system, fast strategies and outstanding software for visual field analysis. Detecting visual field loss at the earliest possible stage, defining the optimum treatment and following up the patient to decide on the necessity of treatment changes or surgery are the main tasks of every glaucoma specialist. Addressing these basic needs, Haag-Streit has introduced the Octopus 600 that combines early diagnosis and follow-up in a single compact-sized, standalone device with improved ergonomics both for operator and patient. The device makes it possible to run standard central fields with minimum test duration, seamlessly integrated into your practice environment. This supports high patient throughput and effective practice management. With its built-in reliability features, the Octopus 600 is easy to use and delivers results you can trust.